While we believe we are building an Utopia on equality, the ultimate outcome of this effort can only be catastrophic, because it is a race to the bottom. It's self defeating, because Nihilism is ultimately destroying all our values. Left: Howard Roark's Speech in The Fountainhead (watch his speech in The Fountainhead). Right: Barack Obama: "You didn't build that"
In Egalitarianism, equality is the fundamental moral value: the standard of good and evil. The value of equality is rooted in Christian and Marxist ethics; but Egalitarianism wants much more than that: it wants equality of outcome - HERE and NOW! But here's the catch in this philosophy. It holds that men are not equally deserving for what they ARE. instead they are equally deserving because they are NOTHING. 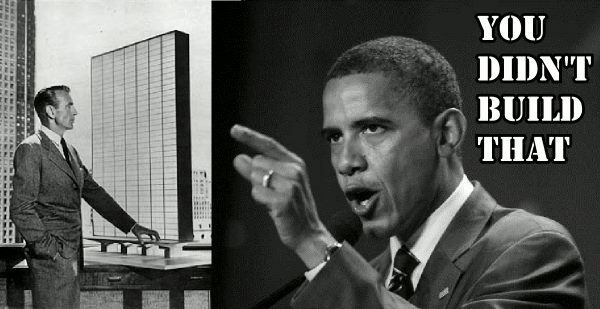 Obama's now infamous quote, "You didn't build that!" perfectly sketches this implied tenet in Egalitarianism. If you have a brain, a will, some skills, knowledge, character, desires, money, power, any ability or attribute, you were lucky, that's all. The actual producer isn't you, but society (which in Socialist thinking has replaced God). And since you can't give man a morality which he doesn't have, the bottom is by definition made up of losers. Therefore equality can only be reached by cutting down the top: "We must cut down the high flyers," animal rights wingnut, Peter Singer infamously stated. Egalitarianism is sheer evil: strip man of all the attributes that make him an individual, and the achievements that distinguish him from any other, and all men become equal. What is left after stripping is an empty shell, in essence a zombie: the ghost of a human being. The root of this ideology is Kantian Nihilism. The elevation of nothing to something. The zombie demands the sacrifice of the living man. The walking dead as the ghost of a moral man is the philosophy that rules the world of the Egalitarian! Egalitarians are group thinkers whose weapon of choice is identity politics. Feminists and LGBTs seek to address sexism, the elderly ageism, the handicapped ableism, the ugly looksism, multicultis imperialism, animal rights loonies speciesism. In this universe competition is naturally evil. There are no winners, no losers: everyone gets a prize, whether deserving or not. All demands are meritous, regardless of merit. The evil of Egalitarianism is perfectly demonstrated in environmentalism. Inanimate nature has the same status as living creatures. Therefore it has equal rights and we must stop defining better as richer, bigger, faster, more. While Marxism still had a vision of a better world, Egalitarianism is a postmodern nihilist construct to rescue Socialism (see flow chart Evolution of Socialist Strategies To Rescue Socialism From Failure); but it does so by the offensive tactic of scorched earth: in death all men are equal. Man is a moral monster that deserves no better than annihilation. First posted on November 26, 2012 under the title: "Why You Didn't Build That". - Leonard Peikoff's "The DIM Hypothesis"
- Think about this: is democracy Egalitarianism applied to government?